1 Begin by boiling rice washing (hugas bigas) in a pot filled with onions, tomatoes, green chilli and gabi. Cook until gabi is tender. 2 Gently add the shrimp, maya-maya and Knorr Sinigang sa Sampalok Original. Let this simmer until cooked through. 3 Now drop in the radish, okra, and long beans. Let these simmer for a minute then add pork sukiyaki and kangkong last. Cover for a minute and that’s our dish! 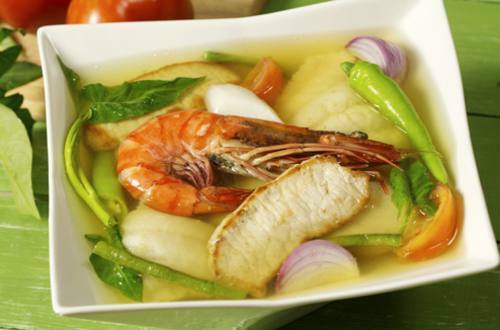 4 Surf and Turf Sinigang is for everybody who wants either seafood or meat or both combined. Whatever the preference is, this is home!